I am used to attending and presenting at board-wide PD days, provincial subject conferences like STAO, and even national astronomy conferences similar to CASCA. But none of these events prepared me for the sheer size of ISTE. The convention center itself was several city blocks long. I didn’t have a Fitbit, but I imagine I were was like many participants who reported walking over five miles a day just back and forth through the conference. It took two days to see everything in the exhibit hall. It was quite shocking to wander through the hall and then stumble upon an entire bus at one company’s pavilion. Attendees for the keynote sessions lined up more than an hour in advance. Once we were inside the lecture hall, which was more like a giant television studio, we were treated to a concert-like atmosphere featuring ISTE’s “house band,” the Big City All Stars from Winnipeg. With such large numbers of educators, it was a humbling experience to be a small fish in such a big pond. But attending the conference with educational gurus such as Nicholas Provenzano (@TheNerdyTeacher), Jeff Bradbury (@ TeacherCast), Rafranz Davis (@RafranzDavis), and Sam Patterson (@SamPatue and @ WokkaPatue) was humbling. In my husband’s words, he went to a session with “some motivational guy” who turned out to be George Couros (@gcouros). I passed by educators such as Jerry Blumengarten (@ cybraryman1), Starr Sackstein (@mssackstein), and Kitty Tripp (@kitty_tripp), who populate my Twitter feed on a regular basis. I was more than a little starstruck (and perhaps even slightly fan girl-ish), but it was very empowering to know that we were all at the same conference. All of us were exploring and sharing the best use of technology to improve the educational experience for our students. These are all teachers who make a big impact on my education world. I would also like to follow in their footsteps in my own way at some point. It was humbling just to be in the same room as many of them. In the end, I was too shy to go up and introduce myself, despite the encouragement I received from my friends back home. Maybe next time. Since starting my BYOD adventure, I’ve often felt like I’ve been reinventing the wheel. I know I’m not the only one trying this in my school or board, but I am one of the first to completely change my classes over to a no-lecture, all student-based style of learning on a large scale. By reaching out on Twitter, I’ve made many connections with teachers in Ontario who are trying similar things. Those relationships have been invaluable. It was comforting to not only be surrounded by other teachers from around the world who are also trying new things in their schools, boards, or districts, but to also have the chance to meet with some of the educators whose journeys have crossed paths with mine. Several times throughout the conference, various speakers made reference to the fact that they were addressing very dedicated teachers. These are teachers who willingly give up part of their summer and spend significant amounts of money to attend conferences like ISTE to become better at what they do. I found it inspirational to see and hear how these other teachers were changing the game. As a different source of inspiration, one particular session stood out. As “flipped gurus” Jon Bergmann (@jonbergmann) and Aaron Sams (@chemicalsams) led the audience through what they found that worked when it came to flipping content, they also spoke about what they tried that didn’t work. It was very motivational to hear how they dealt with their mistakes and moved on. Even these bigger names in education struggle with some of the same things I struggle with. That alone provides me with the encouragement to keep going. It goes without saying that there was more content at this conference than anyone could reasonably take in. There was always something to learn or someone to learn from. I would jump at the chance to repeat the ISTE experience. 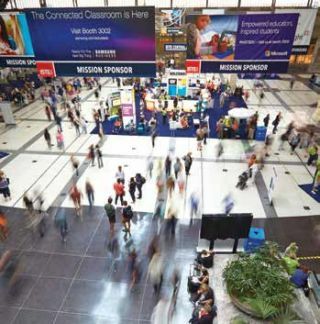 WHAT WAS YOUR BIGGEST TAKEAWAY FROM ISTE 2015? My biggest takeaway from ISTE 2015 is the reminder that we always need to stop, reflect, and ask, “Why?” when it comes to integrating educational technologies. Many times educators and CIOs get caught up in the “hype” of edtech and forget about the importance of pedagogy first. Many keynote and session speakers repeated this point throughout the week. In the fast-paced and demanding world of education we need to remember to pause, step back, reflect, and ask the important questions surrounding the decision to implement a new edtech solution. My biggest takeaway is that conferences like these still continue to inspire the interested and excited. I continue to ask, reflect, and wonder how we will make a deep difference in education systems with the other 80% of teachers and administrators who may be interested in other instructional priorities and needs.